The 2017 Stanley Cup Final begins tonight at 8:00PM on NBC. The Pittsburgh Penguins look to cement themselves as one of the elite teams in NHL history who have repeated as Stanley Cup champions in back-to-back years (which hasn't been done since the Red Wings in '98, and not yet in the Salary Cap era). Meanwhile, the Nashville Predators are hoping to bring the Stanley Cup back to Nashville for the first time since joining the league in 1998. Phil Kessel chasing down P.K. Subban earlier this season. SEASON SERIES: The Penguins and Predators have met twice, once on October 22 when the Predators won 5-1 at home and once on January 31 when the Penguins won 4-2 at home. The game films don't necessarily lend to either team having a structural advantage against the other. Marc Andre Fleury had a bad game in Nashville in October, and the Penguins let the game run away. And Pekka Rinne had a bad second period coupled with an onslaught of penalty kills to stymie any rally energy late in the game when the Penguins won in January. The teams are largely the same, minus two big names - Ryan Johansen and Kris Letang. ADVANTAGE: Neither team showed a definite edge in either game. The team that won was opportunistic, and stayed out of the penalty box. That's not a preview, but just a rule of hockey. FORWARDS: The Penguins' forward depth in unrivaled by any other team in the NHL - and it's not even close. In the salary cap era, teams generally have to chose between star power and depth - but somehow General Manager Jim Rutherford has been able to have both, thanks to a glut of talent on entry-level deals. At center, the Penguins will have Crosby/Malkin/Bonino/Cullen squaring off against Sissons/Jarnkrok/Fisher (maybe)/Fiddler. Since the center is the distributor of pucks, it should be safe to say that the Penguins will have a decided advantage in terms of forward possession. The Nashville Predators will lean on Filip Forsberg, Viktor Arvidsson, and James Neal to carry the offensive load for the team - and they certainly have throughout the playoffs preceding the Stanley Cup Final. ADVANTAGE: Pittsburgh Penguins - they have the forwards to outmatch any team in the NHL, especially the Nashville Predators. The Penguins forwards most difficult opponent this Stanley Cup Final will be fatigue and health. Speaking of which - Hornqvist looks like he will be good to go for Game 1. DEFENSE: The Nashville Predators have a defense that looks great on paper, and statistically. The top 4 of Subban/Josi/Ekholm/Ellis are difficult to reckon with, as the Western Conference has seen. But there is a key weakness - they play a LOT of minutes. So I imagine that they're tired, and will only become progressively more tired throughout the series. They have an advantage over the Penguins in this category, and really in this category alone, so in order to beat the Penguins I would theorize that they need to do it in the quickest way possible. The longer the series goes, the more mileage they will be putting on their workhorse defense core - and run the risk of the core breaking down. Managing minutes on defense is a task that the Penguins have struggled with, but they have been able to spread minutes across all 6 defensemen evenly. 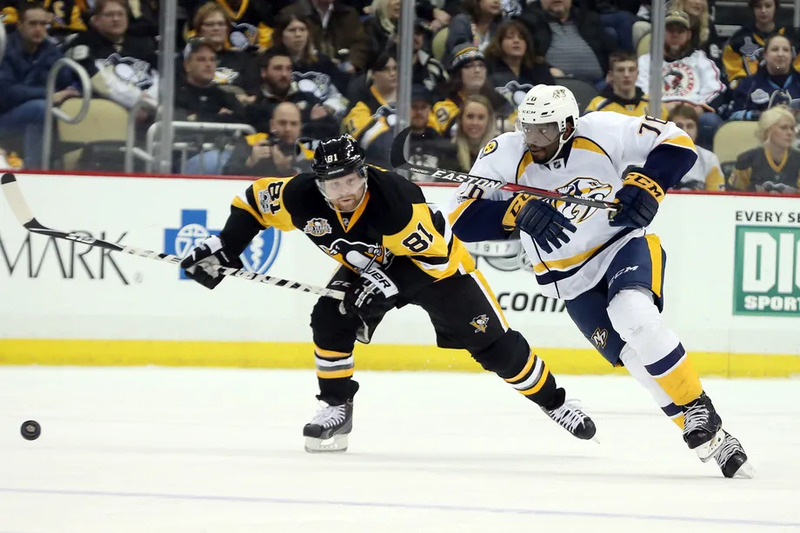 Brian Dumoulin leads all remaining players in time on ice this playoff with 416 minutes - but not far behind him are many Predators (Josi 415, Subban 414, Ekholm 409, Ellis 384). ADVANTAGE: Nashville Predators - but I only say this in the sense that I believe their advantage in defense exists only in a shortened series. Their four workhorses will not age well as the series progresses. GOALTENDING: The two best goaltenders left, statistically speaking, were the two best goaltenders in the NHL playoffs in 2017. Pekka Rinne's splits against the Penguins throughout his career have been abysmal (1-5-2, .880 SV%). Additionally, the Penguins have a decided edge in the fact that they have a goaltender who has won a Stanley Cup before, and if for any reason he is injured or plays poorly - have a backup who has won a Stanley Cup before. Pekka Rinne has had a shaky career in the playoffs and during the regular season. He is what many fans describe Marc Andre Fleury as - a rollercoaster of emotion. If the Penguins want to runaway with this advantage, parking a player in the blue paint to agitate or running up the scoreboard in a game or two could yield a meltdown - which you would never, ever, ever see from Matty Ice. ADVANTAGE: Pittsburgh Penguins - goaltending is a tricky subject. Goalies can be hot and cold. But Matt Murray has ice running through his blood, and if Pekka Rinne of old ever shows up this series - he is volatile enough to run the whole team into the ground. PREDICTON: Pittsburgh Penguins in 7. I think that the Nashville Predators will give the Penguins (and the entire fanbase) a scare with their ability to do something with the 1-3-1 trap. They have a counterattack and will expose the Penguins' defense in a game or two. But, the Penguins coaching staff has been terrific at turning the team around. Sidney Crosby and Evgeni Malkin realize that these opportunities to win a Stanley Cup are rare, and I think that they both will carry the team to a grueling series win - and whoever carries the team more this series will win the Conn Smythe.